So you got into a postgraduate programme. Now what? Whether you’ve come straight from an undergraduate degree or had a little break in between, going into a postgraduate course can be a difficult transition. The workload is usually much heavier, and you’re expected to take things a lot more seriously than in your first university experience. However, even though you may be tempted to solely focus on your academic performance during your time as a postgraduate student, it’s important to do things you probably won’t be able to do when you enter full-time employment. Postgraduate student is basically a second chance at student life. You’ve done your first years as an undergraduate, starting as naïve fresher, but that probably wasn’t enough. Living in a student bubble, however unadvisable it is to ignore real life, is the ultimate bliss. 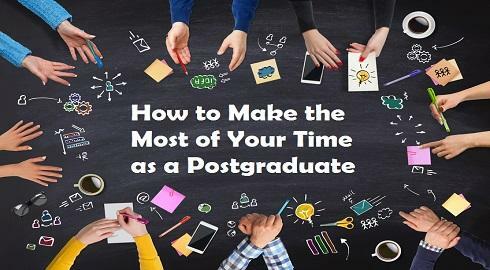 So how can you make sure you make the most of your time as a postgraduate student? After all, this may be your last stay at the bubble, so you’ve got to make it count. Here are few different ways you can make the most out of this new experience. See what else is out there. If you’re doing a vocational postgraduate degree, you probably already have quite a set idea of what you want to be doing professionally, but there’s nothing stopping you from looking around. Think about your passions and interests and see if there is something else you would like to try before you commit to a full-time role when you finish your course - you may actually be surprised. Work shadow someone you find interesting, get work experience in a new field, attend industry careers. It’s easy to get blindsided by something you’ve worked so hard towards for the past few years, but it’s okay to have a change of heart. Trying different things will open your horizons to different career paths or confirm your one true passion. Even though donating time to a charity is still perfectly manageable once you start working, it can become tricky when there are work commitments and tighter schedules. Take your time as a postgraduate to make a positive impact in the world. Not only will it make you feel good, which could ultimately actually help you in your studies, you will also meet people and have new experiences. Plus, making it a consistent part of your life at this point will make it easier to carry on after you leave university. Sadly, long breaks stop being a thing the moment you sign an employment contract. So if you have the means to, take long trips, explore as much as you can, or just enjoy time off without work worries. Obviously you still get those things when you’re working, just not so often. Not particularly groundbreaking, but think about it – when else will you have a chance to join the Harry Potter or the Mario Kart society. Sure, you may still join societies when you start working, but finding the time and the motivation to break your weekly routine will not be easy. Plus, many activities considered acceptable as a student suddenly become frowned upon when you’re a fully functioning adult with a full-time job. Dressing up as Viking may be okay for students in Plymouth, but maybe not so much when you finish your 9 to 5. We may not all become Bill Gates or Richard Branson, but you can still give it a go. When you start working, having any sort of coherent thoughts after you turn off your computer is a struggle, let alone starting a business from scratch, so your time as a postgrad might well be your time to shine. Taking action on your ideas has always been a great thing, but being entrepreneurial is especially important now. The internet has made it ridiculously easy to create your own way of making money, be it by selling a skill you’ve got like coding (which you can also learn online, thanks Internet! ), setting up your own website to sell products you make, or even finally cashing on that not-so-in-vain-after-all knowledge of social media and manage Instagram or Twitter for a small business. Possibilities are endless, quite literally. Plus, entrepreneurship is employers’ favourite buzz word of the moment, so you’ll at least get that skill checked off your CV, even if your business doesn’t make you millions.